Raising the royal roof! Prince William turned Kensington Palace into a huge party pad on Wednesday night, November 10, to raise $1.9 million for the homeless charity Centrepoint. The Duke of Cambridge, 34, was joined by 420 guests and friends including celebrity pals Ellie Goulding, Elizabeth Hurley, Joan Collins and cousin Princess Beatrice. Guests had paid up to $6,250 for a ticket to the event, which took place at Kensington Palace&apos;s Orangery. 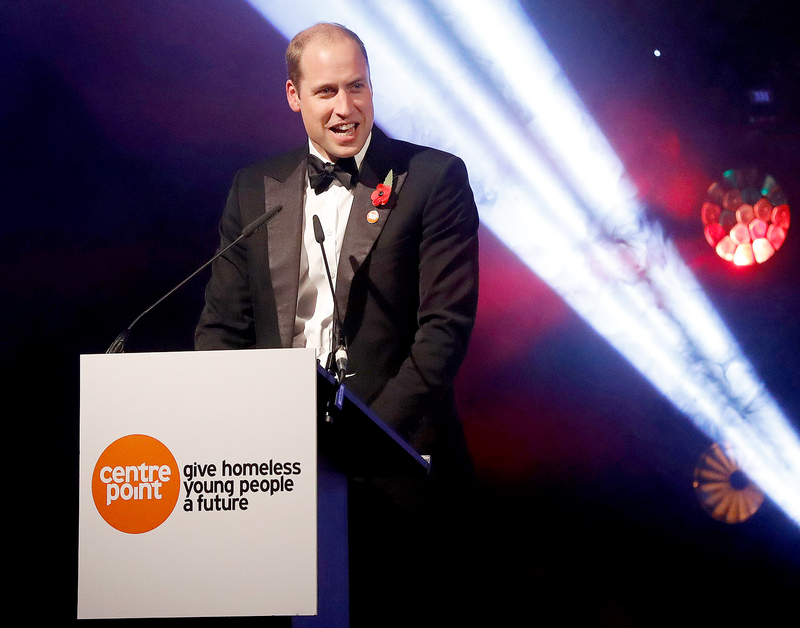 Centrepoint — which works tirelessly to provide young homeless people with a positive future — was one of Princess Diana&apos;s favorite charities and has become a key organization for William. Every year the prince hosts a fundraising event for them. Goulding, 29, wore a ruffled black lace gown and performed at the Chopard-sponsored event alongside other singers including British R&B vocalist Craig David. Phil Collins was originally in the lineup but had to pull out due to illness. Kicking off the evening&apos;s festivities on stage, a tux-clad William joked, "Last time I was on this stage I performed a duet with Bon Jovi and Taylor Swift. Craig [David] and Ellie [Goulding] will be spared that horror tonight." He added on a more serious note, "This evening is a celebration of everything young people are capable of when they are given the support that they need. The young people of Centrepoint have come through experiences that could have broken the resolve of any one of us." Later at the event, Centrepoint ambassador and chat-show host Jonathan Ross hosted an auction that included a private jet vacation and the chance for a child to become a character in the next David Walliams novel. Awards were also given out, including Centrepoint&apos;s Youth Inspiration Award to funk legend Nile Rodgers for his We Are Family Foundation work, which supports disadvantaged young people in America. PHOTOS: Prince George, Princess Charlotte Steal the Show on Royal Tour of Canada: Cutest Pics! 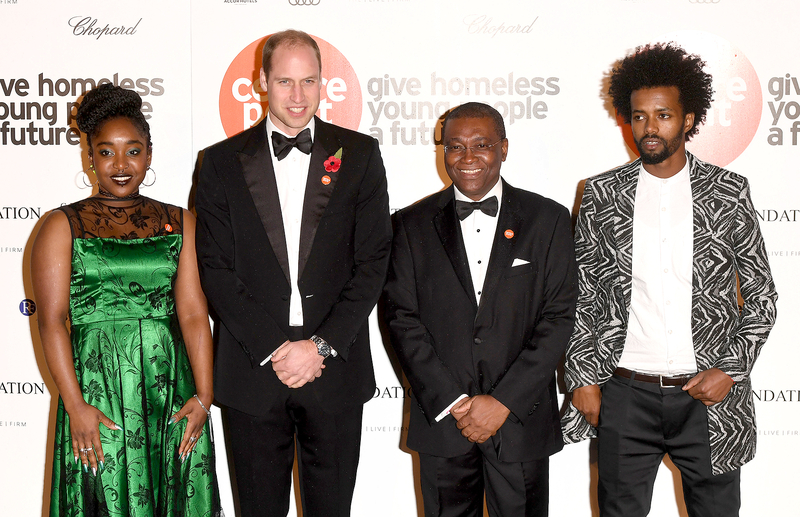 Chief executive of Centrepoint Seyi Obakin tells Us Weekly of the prince&apos;s work: "We were his very first patronage and I have not seen him at all — at any other time — more committed than he is now to see youth homelessness ended. That&apos;s a tough call, a big vision, but we believe it can be done." Adds Goulding, "It’s very easy for a young person to become homeless, and it can happen very quickly. It’s terrible to think that there are thousands of people, not much younger than me, who find themselves with nowhere to go and feeling like they have no place in the world." Earlier in the evening Ross joked with the Duke about Elizabeth Hurley&apos;s racy E! drama series The Royals, which follows the lives of a fictional British royal family. "I don&apos;t know if you&apos;ve seen The Royals?" he asked. William laughed and shook his head. "I thought not," replied Ross. "I can get you a download if you like."